With all the news media attention lately, you’ve probably heard about Google Plus by now. But what about that little known facet attached to it, the Google +1 Button? Google Plus is being set to rise as the next competitor to social media giants like Facebook and MySpace, but what about the Google +1 button? It’s basically the same as the Facebook “Like” button. Are people paying attention to it, and will Google want to continue its use in the future? To get an idea of whether people are using the Google +1 button or not, I decided to see which of the top 100 sites on Technorati had actually implemented a +1 button for sharing purposes. As can be seen in the pie chart, there were an overwhelming number of sites that had not inserted the +1 button. Next, I took a look at thirty of the newest posts on Social Media Examiner to see how the Google +1 button was stacking up compared to Facebook “Likes” and Twitter “Retweets.” Again, it was overwhelmingly underused compared to Facebook and Twitter usage. To get a second look, I did the same thing with Mashable. Out of the thirty newest posts made at the time, I came up with this data. 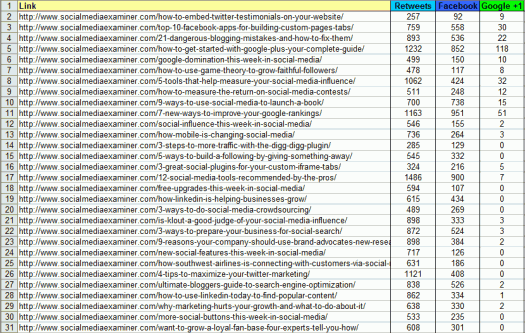 It is very similar to what I found when I looked at Social Media Examiner. Retweets win out as the most used, Facebook likes come second, and Google +1 comes in a far last place. With both Social Media Examiner and Mashable, the Google +1 button is just as visible as the Facebook “Like” button and the Twitter “Retweet” button. They are all displayed in the same format and just as easily accessible. Clearly the Google +1 button is not being used on a large scale like those for Twitter and Facebook. Not much attention has been given to the +1 button as of yet. The real question now is: with the new ramping up of Google Plus, will we see the Google +1 button usage rise in unison, or will the +1 button continue to flounder leaving Google with a decision of whether or not to scrap it all together? From a user standpoint, what does the +1 button do? Facebook and Tweet this buttons share the link to your profile on those sites. 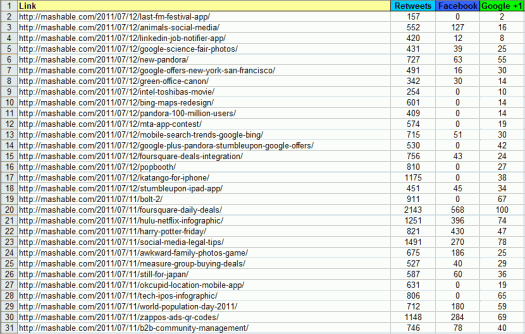 Google +1 (so far) seems more useful at giving Google data to use for search algorithms than sharing with actual users. From what I’ve seen, +1’s only appear on your +1 tab on Google profile. Until Google+ becomes used more and +1’s become more visible on Google+, I don’t see them becoming used by users very much. It looks like Google intends for it to be adopted heavily in their search results. The problem with this is that not everyone wants personalized search results. I definitely don’t want to stay logged into Google the same way I do Facebook and Twitter because I don’t want personalized SERPs. I dunno. I just saw The Atlantic adopted the +1 and I immediately gulped. I really don’t want to add something else that barely gets used to slow down access to my site. I’m just pushing that much more with Facebook likes. I added a link to “like” my page on my About Me, and I added the script for liking every single one of my posts to Tumblr. I don’t know if Google has quite figured it out yet, but promotion is only as good as the network you promote to, esp. when we’re talking about “recommendation” more than search. This is just informal observation of the sites I visit, but I’ve noticed the +1 button getting used more than I initially thought it might. It’s definitely gotten more use than the Buzz buttons did. On many sites I see a similar amount of +1s as Likes. Again just informal observation on my part. I think it’s low adoption has a lot to do with its newness. Many sites will only use it after it’s proven itself. @Adam – Anything you +1 shows up on your Google profile page, which you need to create and make public as part of joining Google+ You can still create a profile page if you haven’t yet opened a Google+ account. btw – came here from Blog Engage so I clicked buttons over there too. I have been wondering about the Google +1 button myself. While I have added it on my blog, I’m contemplating taking it off as it doesn’t seem to do a whole lot. I don’t think I have clicked it on other sites, even though the button is usually located next to the other social network sharing buttons. I’ve clicked the tweet button, but haven’t really used the +1 button. I’m sure if people were told that the Google +1 button had a dramatic effect on search results, then everyone would be using it. The problem is, it probably won’t happen since it would be too easy to game the results. I think a large majority of people outside our realm have no clue what Google+ is, yet. Have s look at who is currently using Google plus. According to Mashable, most users are male, with about 60% of them being developers or software engineers. A far cry from the mainstream Internet users on FB or Twitter. Personally, I think many site owners are still focused on how to properly utilize FB for their marketing and get a little overwhelmed contemplating incorporating a new SM into their strategies. But, eventually I imagine entire companies will be based on teaching to market using this new SM, just as they have done for Facebook and the others. As far as utilizing the button on my own websites, if I must, I must. Just as soon as I get to it. Well it seems to me rather interesting that the Google +1 appears next to the general listing of a Website in Google Searches. I’m not entirely convinced that people would like a site when they haven’t been to it yet and if they have I’m not overly sure if they’d bother going back to the general listing in order to do so. So in essence I’m not at all surprised to see your stats of folks not really running with it. I think it was interesting that Google launched the +1 button before launching Google+. Had it been the other way around, people probably would have been more likely to understand it from the beginning. Now that there’s that connection to your Google+ profile, +1’ing things makes more sense. Personally, I don’t really +1 things because I hate the idea that my search results are being altered based on what Google “knows” about my interests. I think the motive for the +1 button not being implemented by a lot of sites and it’s usage not being as high as the Facebook’s is that not many people have Google+ profiles yet. When people will get used to Google+ as they did to Facebook, they will stop ignoring it.